In another article, I discuss the issue of acceleration and cleanup in the missed approach. The Boeing 777 FCTM mentions accelerating at 1000 ft (AAL) in the missed approach, and many airlines use this point on two engine missed approaches. As discussed – this is inappropriate and potentially dangerous in the event of a single engine missed approach as terrain clearance is not assessed. We use the Missed Approach Altitude MAA (or if lower/higher and more appropriate, the Minimum Safe Altitude MSA) instead. We use this point on both all engine as well as engine out go-arounds to maintain procedural consistency and reduce the likelihood of a crew acceleration (inappropriately) early on a single engine missed approach. Recently I was asked about early ALT capture in the missed approach. The issue of concern was whether we could accept “early” acceleration in the missed approach when it’s associated with AFDS ALT capture. In essence – this is acceptable and in fact expected two engine go-around behavior. Basically when you’re climbing up towards an altitude at which you intend to level off, the Autopilot Director Flight Director System (AFDS) is aware of this since it’s usually set in your Mode Control Panel (MCP). The AFDS monitors your current altitude, your rate of climb and your target MCP altitude during the climb (among other things …) and schedules a capture of the altitude earlier if your climb performance is good. At some point you enter a capture range as you near the target altitude and an altitude capture mode engages in the AFDS. This is indicate by ALT on the Flight Mode Annunciator (FMA) and the AFDS either (a) commands the flight director to provide guidance for the level off; (b) commands the autopilot to action the level off; or (c) or both. How early the capture phase begins is mostly dependent on your rate of climb. A rule of thumb when manually flying is 10% of your rate of climb. If you’re going up at 1000 ft/min – you can expect to have to begin the level off at 100 ft to go. My read of the AFDS is that it’s a little more sophisticated than that (one would hope so …) – it schedules level off much earlier than I would when manually flying – see the picture above. 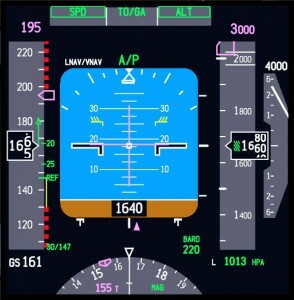 The AFDS level off process is?primarily limited by a “g” limit that the autopilot is is allowed to actuate through the flight controls – aimed at providing a smoother ride with less stomach pulling for the passengers. Note : It’s worth noting that during climb you’re in a speed-on-elevator mode where speed control is provided through pitch (elevators). When leveled off – you’re in a speed-on-thrust mode where the autothrottle moves to protect speed. However during the capture you’re on neither. I’ve seen this myself on several occasions, where a change in MCP speed or thrust available – or resetting the QNH – completely throws the AFDS and a reversion to basic modes or manual flight is required. The classic scenario in the sim is to fail an engine in a two engine go-around just as the AFDS captures altitude early because of climb performance. Pilot intervention is almost always required as the aircraft tries to follow a 3D capture path based on 2 engines, using the thrust available from just one engine. 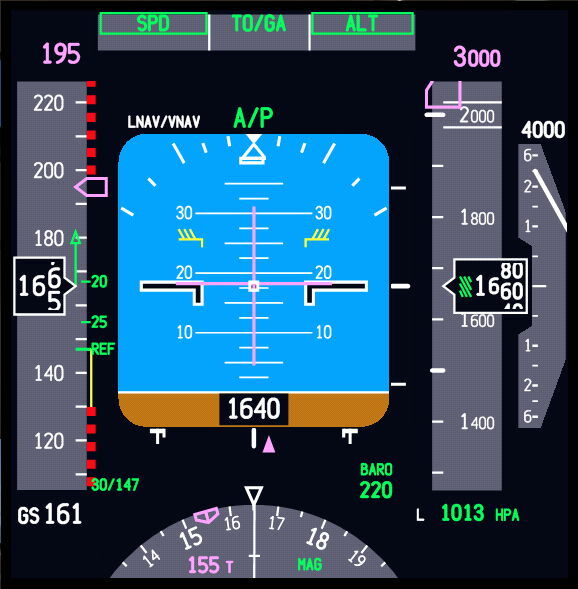 The missed approach – particularly the two engine missed approach – can be an extremely dynamic regime where large rates of climb – anywhere from 3000 to 5000 fpm – can “normally” be achieved. As such the capture phase can begin quite early, and owing to the dynamic nature of the maneuver – can seem too early for a normal level off. This is where the question comes in. I recently encountered pilots who were intervening in the event of an early ALT capture off a two engine missed approach, because our SOP is to continue missed approach climb to the MAA. This is not required. On a two engine missed approach, the climb phase can be thought of as over when the AFDS enters ALT capture, even if it seems to be doing so well below the MAA. Early altitude capture is (usually) an entirely normal and appropriate action by the AFDS (or the pilot) and the SOP to climb to the MAA before accelerating was never intended to preclude this. In any case – on a two engine missed approach you’ll (almost) never be limited by?terrain clearance and commencing level off at an altitude below the MAA appropriate to the rate of climb is absolutely normal. ?The issue doesn’t present on single engine go-arounds because the climb performance isn’t there to generate early captures. None of this is of course intended to limit the PF/Captain from taking action in the event of inappropriate behavior of the AFDS – Fly The Plane.